Lime, the bike and scooter-share company that recently raised $335 million from GV, Uber and others, has hit six million rides since launching last June. Lime, which first launched in Greensboro, N.C., has since expanded to 70 cities. In comparison, Bird announced in April it hit 1 million rides since launching in November. Lime’s ridership in San Francisco is currently on hold as the city reviews permit applications from 12 companies to operate electric scooter services. 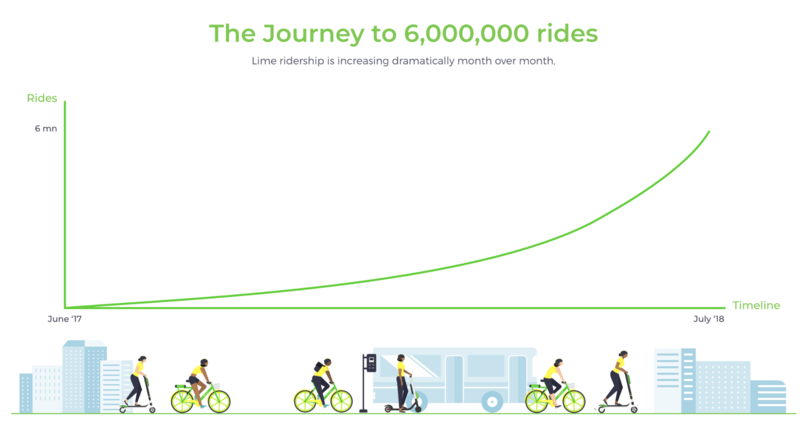 But during the short period of time (from March through June) that Lime did operate in San Francisco, its scooters saw 300,000 rides. Over in San Diego, Calif., its scooters facilitated 1 million bike and scooter rides in five months. Electric scooters are hot right now, with VCs pouring hundreds of thousands of dollars into the space, and ride-hailing companies placing their bets on scooter startups. Lyft, for example, has laid out its ambitions for electric scooters, as well as bikes. Meanwhile, Uber, as mentioned above, invested in Lime as part of a deal to put Uber branding on Lime scooters. Be sure to check out TechCrunch’s scooter coverage below.